There are many millions of colored and animated lights that come alive during the Winter Magic and Winterfest celebration seasons of Gatlinburg and Pigeon Forge. Here’s how to see the best displays of lights in the area, by trolley and by car. 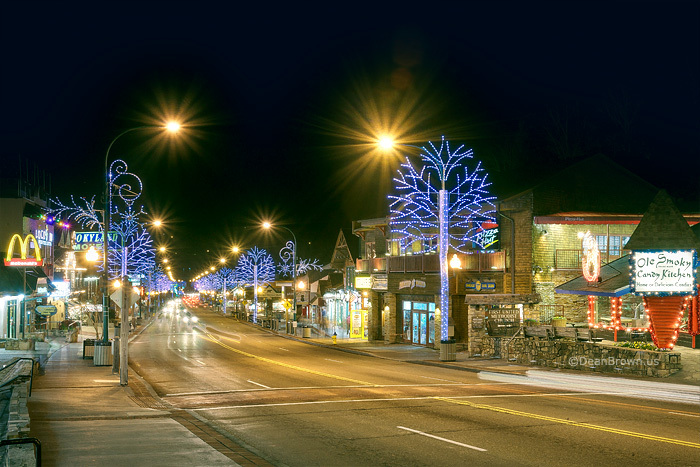 If you want to view the festive lights on display throughout the town of Gatlinburg, all you have to do is embark on the specially designated trolley that leaves from downtown and let your driver take care of the rest. The Gatlinburg trolley tours usually begin in early November and run until late in January. Trolleys depart from the Aquarium three times each weekday evening through December, winding down the frequency and ultimately ending during January. The 45-minute tour costs $5 per person (children under three who are sitting on an adult’s lap are free). To see the current dates and times, check the Winter Magic Trolley Ride of Lights page. The Trolley Ride of Lights will take you past the lights of the downtown area, including Parkway and nearby River Road. You will also traverse some of Highway 321, and throughout the town you will see beautiful light displays with animated animals, characters, dancing fountains, and any number of Christmas scenes. This trolley tour is great for groups who want to relax as a family and enjoy the lights together, because no one has to worry about driving. It’s a great way to take pictures and videos too. And you’ll enjoy engaging commentary by an experienced tour guide who knows the history of the places and the famous displays. Please note that no food or drink is allowed on the trolley, and since the trolley is heated and enclosed you may want to dress in layers. Also, groups of 10 or more should make a reservation, and note that there has to be a minimum of 15 riders for a tour to run. Not to be outdone by its neighbor to the south, Pigeon Forge puts on its own celebratory display of lights every winter for you to enjoy. Pigeon Forge no longer offers a trolley tour of the lights, and instead publishes a free map each year of the best lights so that you can navigate through the lights on your own. You can pick up a free copy of the Driving Tour of Lights map and brochure at any Pigeon Forge Welcome Center. There are more than 5 million lights on display throughout Pigeon Forge, and many of them are located on the Pigeon Forge Parkway that runs through the center of town. You can also visit Dollywood’s Smoky Mountain Christmas to get a dose of holiday cheer – and a few million more lights. And there’s a stunning collection of lights at Patriot Park, just northeast of Parkway. The Pigeon Forge Winterfest Lights usually turn on in early November around Veteran’s Day, and stay on until late February. The self-driving tour of the lights is perfect for families who like to plan their own routes and schedules, travel with pets in the car, or have small children who may be uncomfortable on longer trolley rides. Gatlinburg and Pigeon Forge aren’t the only sources of holiday lights in the area, by the way. Check out our guide to the major Christmas Lights in the Smokies for the best displays of lights (and fireworks) during the season. Whichever town you prefer to be closer to, we have cabins all over the area that can put you where you want to be. Check out our Gatlinburg Cabins and our Pigeon Forge Cabins pages, or for a little quieter (and very scenic) area, try the Wears Valley Cabins page. And all cabins get our Free Ticket “TripCash” book of Pigeon Forge and Gatlinburg Coupons, worth over $400!